Ancient Dead Sea Mud has traditionally been used and known to purify, moisturize and revitalize skin in beauty care regimes from the time of Cleopatra. This unique mud from the floor of the dead sea contains more than 26 minerals in higher concentrations than found in any other body of water in the world. The mud infuses the skin with minerals that have been shown to regulate and activate cell functions while replenishing skin. It naturally exfoliates skin improving texture and removes toxins and impurities. Dead Sea Mud also tightens and tones the skin, improves blood circulation, hydrates and supports skin regeneration. 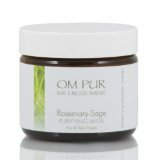 OM PUR revitalizing and detoxifying mud mask is infused with purifying essential oils of rosemary, sage, lavender, basil and lemon myrtle. Blended together, these oils provide excellent antimicrobial, purifying and anti-inflammatory benefits. Rosemary is a strong antioxidant that also stimulates blood and lymph and promotes cell respiration and detoxification. Basil oil is also known to energize and decongest skin. Your skin will love the results and the inviting and invigorating aromatherapy. Usage Gently massage the mud into cleansed skin. Avoid eye area and lips. Leave on for 5-15 minutes allowing the mud to slightly dry. Rinse with warm water or first lay a wet cloth on the face for a few seconds to soften the mask before rinsing off. For best results, mist with the Lavender-Neroli Toning Mist to balance the skin’s pH after removing the mask. Use 1-3X/wk.